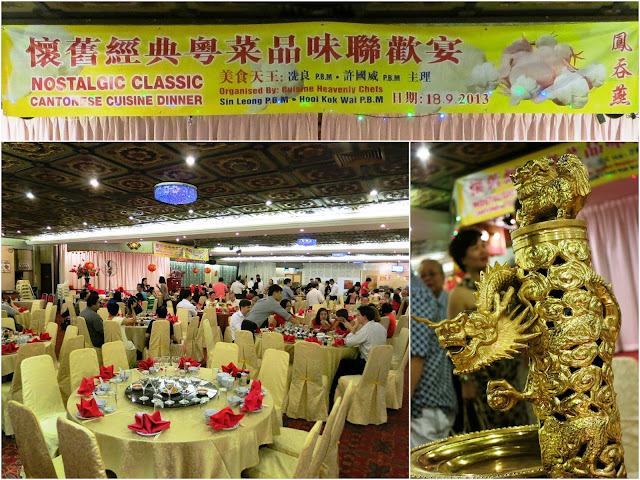 It's not an exaggeration to term this dinner as epic which attracted almost 200 of us, the largest makan group ever. Put together by the oldest online eating club in Singapore, we may have different reasons for coming to these monthly gatherings, but one thing I know for sure is that everyone present shares a common love for good food. 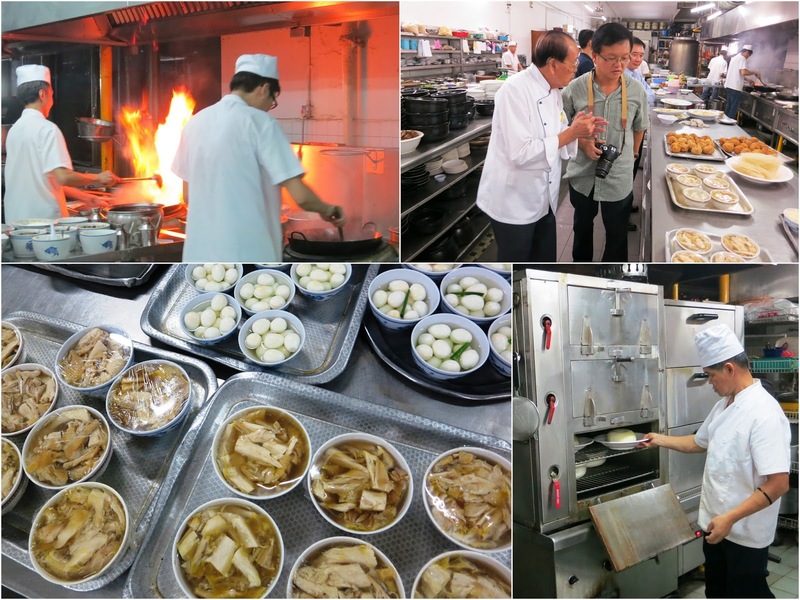 I will say this again at the risk of sounding like a broken recorder to some of you who have been following my posts on Makansutra dinners: Thanks to Andrew and Tony who had been tirelessly organizing the dinners month after month. They have been doing this for these 12 years! As with many of the previous Makansutra dinners, I was again on time, but early. It is an unspoken understanding that dinner will almost always start later than the indicated hour, very much like a Chinese wedding banquet. Still, I couldn't get it out of my system to be punctual and always ended up waiting at my seat and hearing my tummy growl in hunger. But this time, the PinkyPiggu got an 'early bird' treat! As I arrived and was putting down my bag, my dining companions have already grabbed their cameras and were scurrying towards a door at the back of the restaurant. Where to??? I don't know!!! but I quickly followed lol. It was a step into the kitchen of Red Star where all the actions takes place. 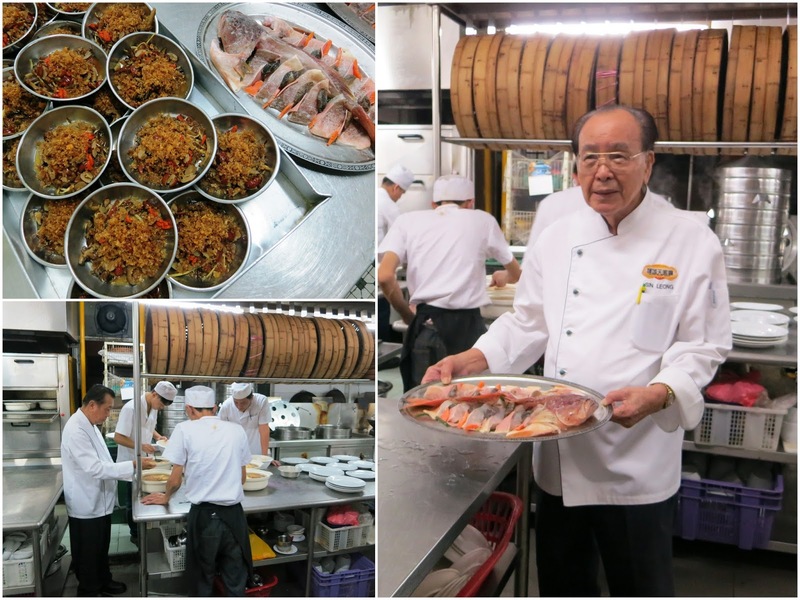 We were privileged to be given this chance to catch a rare glimpse behind the preparation of this feast. The chefs are well into age but are still strong and overseeing the cooking personally. Dinner commenced with a quartet of starters. Deep fried chicken liver with Pig Caul was a medley of a whole salted egg yolk, mashed chicken liver and crab meat combined, which was then tediously wrapped in pig caul and deep-fried. 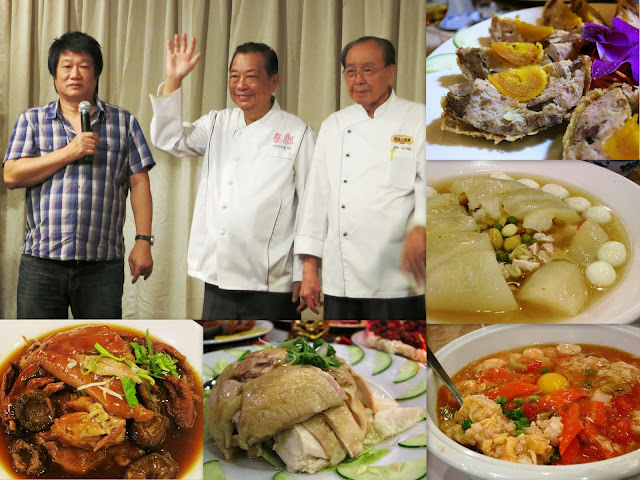 It's quite an unique blend of flavors and textures where the different components (except for the salted egg yolk) would have been rather hard to discern had it not been explained by the chefs themselves. I thought I should cleanse my palate with some cucumber before moving on to a piece of the Drunken Chicken, and took a slice from the chicken plate itself. The strong bitterness of alcohol which hit me in an instant was completely unexpected. Alcohol infused cucumber! *faint* The chicken, though nicely poached, was just as overwhelmingly heady, making this potent dish an 'knock-out' indeed. If my spirits was dampened by the earlier two dishes, it did not take too long for it to be lifted up again with the highly enjoyable Minced Venison on Rice Crust. A delicious snack of crispy rice crackers topped with savory minced venison and assorted vegetables, flavors were well-balanced and textures paired impeccably well. The name of Golden Coin Chicken for a dish was totally misleading as each piece of meaty chewy goodness contain nary a sliver of chicken at all, but is made up entirely of pork. This is a very traditional Cantonese roast of pork loin, ham and candied pork lard layered together, skewered and then barbequed. Next, it was a showcase of seafood. Old-style Steamed Triple-layered Garoupa featured a melange of mushrooms, cuttlefish and tangerine peel layered between the fish meat, imparting both texture and flavor, quite an unexpected change from the usual way done with finishing sauce of soya and hot oil. Pan-fried Jumbo Prawns certainly lived up to its name: The prawns were jumbo-sized indeed. Its coat of BBQ sauce leaned towards the sweeter side, and goes well with the firm succulent crustacean meat. 3 Legged Duck, what an interesting name for a dish. 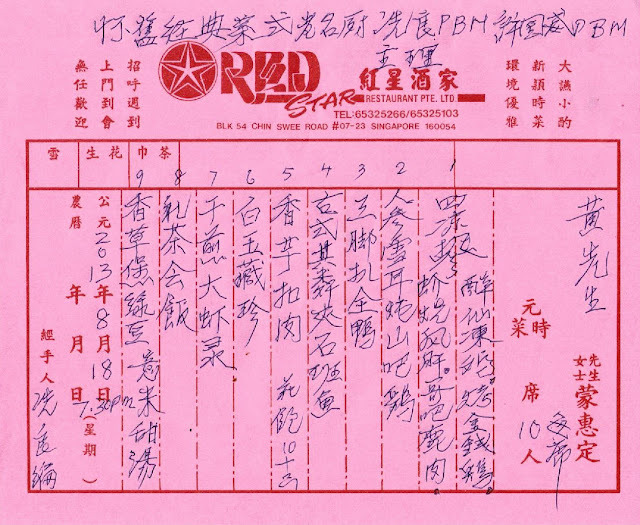 We were pre-empt with a teaser that it's a pre-war Cantonese village classic dish, come and find out what this is. Far from discovering a poultry with ambiguous birth, it's in fact a trio of braised legs - Pork Trotter, Duck Web and Chicken Feet - sharing the same plate. Gelatinous, fatty, heavy on the palate, yet fragrant, strangely addictive and a lip-smacking joy to slowly relish in. If the previous dish was sinful, Stewed Pork Belly with Yam was equally so. Braised with soya sauce to a shade of mouthwatering brown, it wasn't as salty as I've imagined it to be but was in reality a tad subtle. 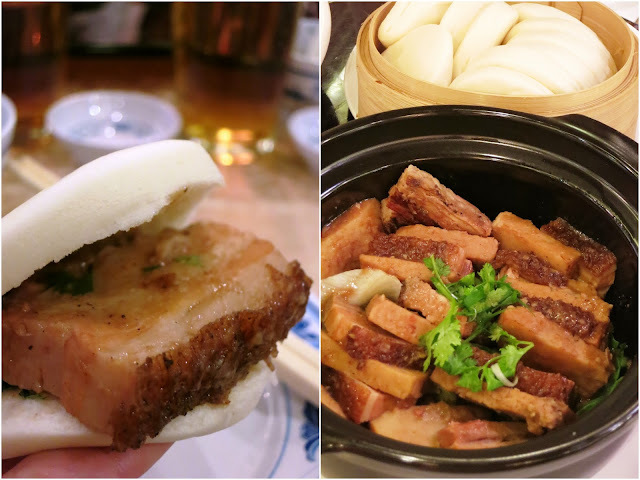 What made the pork belly meat sinful was the layer of fat. Visibly thick fat that was wicked to the waistline but forgiven for its delectable taste and impeccable pairing with yam and steamed bun. Sandwich in Chinese style. I like. Now we came to my favorite dish of the evening, Treasures in Jade Bowl! I didn't expect to be bowled over by this pallid-looking dome, but like a lesson which always needs reminding: Never judge anything by its appearance. The wintermelon bowl revealed itself to be an inner beauty brimming with bits of chicken, gingko nuts, peas and carrots all steamed to perfection. The stock was delicate in flavor yet intensely appealing in taste. The string of hard-boiled quail eggs was just as humble as the rest of the ingredients but enjoyable. Simple and comforting - That may be my best words to describe the dish as a whole. Love it. The Celebration Braised Rice easily put a smile onto one's face with its cheerful shade of colors. It's a customary dish where a newly wed bride will present to her parents when she returns to visit them after the 3rd day to signify her fertility. The white rice, when mixed well with prawns, crabmeat, raw egg and the smooth sweet tangy tomato-based gravy, reminded me of creamy risotto. Even though this was the last main dish of our meal, and considered a heavy one laden with carbs, I did not have any trouble finishing my portion of this surprisingly appetite whetting rice. Not only did the dessert failed to impress, it was disappointing as the Traditional Green Bean and Barley cooked with Herbs smelled too weird to stomach after a few spoonfuls. We had initially attributed it to the herb used, but an apology from Chef Sin Leong the next day confirmed that the green bean was burnt. Unfortunate glitch, but Chef is commendable for his honest admittance of the oversight by the kitchen. Dinner still managed to end on a sweet note as the mooncakes were served in celebration of the nearing Mid-Autumn Festival. A genuinely kind gesture which was a pleasant surprise for us all. This dinner brought warmth to my heart as I see the unreserved passion for food displayed from all sides: the continuous efforts of organizers, the hearty appreciation of diners and the chefs who preserved and brought us a part of culture from an era gone by. Thank you all for the wondrous dining experience. Lastly, here's a video of the dinner taken by the Makansutra team that evening. They couldn't have captured it any better. So you are meeting up with the chefs, Great pic.